You are at:Home»Great Falls Montana»Q-Burger! It’s the Q-Burger at Goode’s. 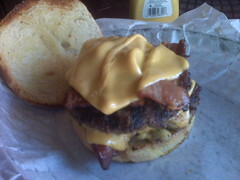 Two six-ounce beef patties, topped with bacon and cheese. It’s just that simple. No lettuce, no tomato, no onions, no pickles, no mayo, no mustard, no ketchup – just meat, cheese, bacon, and bun. BEST. BURGER. IN. GREAT FALLS. Period. End of story. ‘Nuff said. I LOVE Goode’s Q. They have delicious food, and the folks who own/run it are always so friendly. So I went and ate at Ford’s today. I must say – I was quite nonplussed. I ordered a cheeseburger, onion rings, and a small malt. I got a little-bitty burger, about 6 small onion rings, and a 6-oz malt for just under $8! The burger was fair, as was the malt. What’s all the hype? 2K’s Kafe on South 4th St. is 20-times better. You get a HUGE, delicious, juicy, BEEF burger, big enough for two people, complete with fries or tots, for around $6.